If you consistently ship from manufacturing sites to reach multiple customers, you can consider lowering your shipping costs by opting for cross docking. 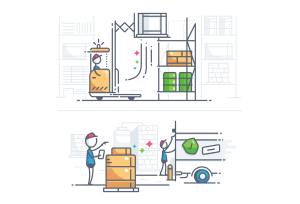 In addition, cross docking is good for you if you do not have the materials, labor, equipment, and physical space necessary for special order fulfillment, palletizing, as well as other packaging and labeling activities at your manufacturing site. At 3PL Center, our cross docking solutions allow companies to send bulk shipments via intermodal container or full truckload to our warehouse that’s closest to the customer base. We also offer this service for trucking companies needed to unload half their truck while they make deliveries and can come back later to pick up. In the world of logistics, cross docking is recognized as the practice of unloading materials from an incoming shipping container or truck, and then loading them in outbound trucks, shipping containers, or trailers. In most cases, these processes can be completed in a short period of time. In addition, cross docking is an outsourced activity. Third party logistics companies are usually hired to deliver a solution for retailers and wholesalers. As mentioned, your cargo will be unloaded from one truck before being loaded into another waiting container or truck. This can happen due to the need to combine materials from different origins, sort materials intended for different destinations, or a change of conveyance type. All in all, you will benefit from cross docking services if you need to consolidate shipments from multiple vendors to a single customer. Why Should You Choose 3PL Center for Cross Docking? 3PL Center has a combined experience of more than 45 years. We operate and manage premium-level warehousing facilities, and offer turnkey solutions to facilitate a powerful supply and distribution chain for our customers’ businesses. What’s more, our facilities are designed to facilitate cross docking procedures. We have large staging areas and access to proper equipment to make cross docking a seamless process. When you work with us, you are guaranteed accurate and timely delivery of your products. Since our inception, we have been working with many customers by receiving their international shipping containers, staging their goods, re-crating them, and shipping the merchandise to the final customer. Inventory efficiency: Your merchandise or inventory is set to move directly from the receiving to shipping docks. No storage warehouses are needed for cross-docked items. This helps reduce the total system inventory in the supply chain. Operational efficiency: Materials will be moving directly from the receiving docks to the staging areas or shipping docks. That’s why the materials do not have to be stored at the warehouse. This increases the overall efficiency of warehouse operations. Ready to Get Started with Cross Docking? If you are seeking stellar cross docking services for your next shipment of merchandise, you can tap on our cross docking capabilities by giving us a call at 732-391-2500 or emailing us at sales@3plcenter.com today.